The focus errors that I have seen posted using the SLRMagic 50/f0.95 exceed the errors that I had on the Canon 7 with 50/0.95 lens. To have a valid reference, we need to be comparing apples to apples. In other words a controlled test. B) Focus Distance = , 0.92 aperture (f/0.95 would be closest. There are f/0.9 lenses but does not work on M mount). It is also not a fair comparison for film results to digital results - as previously discussed. 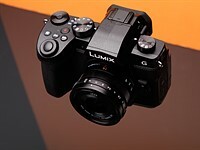 It is also common that the level of CA on the HyperPrime T0.95 is constantly compared with the 50mm Summilux f/1.4 lens which is not a valid comparison. It should be compared with other f/0.95 lenses. If such un-matched comparisons are used in discussions, there are not much to discuss further on. Likewise, the 50mm Summicron f/2 just announced will be better performing than the Summilux f/1.4 and the Noctilux f/0.95 as well in terms of CA control and light falloff due to the smaller maximum aperture size. It has been discussed on the LFI Feb 2011 issue that fast lenses are not dead on perfect all the time. If it is not true, then LFI would not publish this article. The photographer mentioned sometimes there is front focus and sometimes there is back focus. The Photographer said "the trick is to focus a little further or stop down even more" - which means you have to learn the characteristics of the lens. Such problems would not happen on a f/1.4 lens because it has a lot more depth of field than the 0.95 lenses. Many on multiple forums suggest Leica has great service when this issue happens with the Noctilux. Actually, to correct for the front/back focus issues of Noctilux, you can send lenses and camera together at the same time to Solms for pairing. In Hong Kong, owners can send the HyperPrime and their M9 to us for pairing. There are slight tolerances in both the camera and the lens and to have them work best at 0.95, you need to send the combination to us for pairing like you would with an M9 and Leica Noctilux to Solms. Leica is not able to calibrate camera or lens to pair together separately and we cannot either.